A couple weeks ago, Danielle came to visit me for a day. We met up mid-afternoon because I had work, but we still made the most of our day. I decided we go to the infamous Mission district in San Francisco, an area often less explored by tourists or day trippers. I did not have much in mind other than window shopping along Valencia Street and making a stop at Dolores Park. We did both those things, in addition to visiting the popular Balmy Street Murals and grabbing some delicious Bi-Rite Ice Cream after dinner. 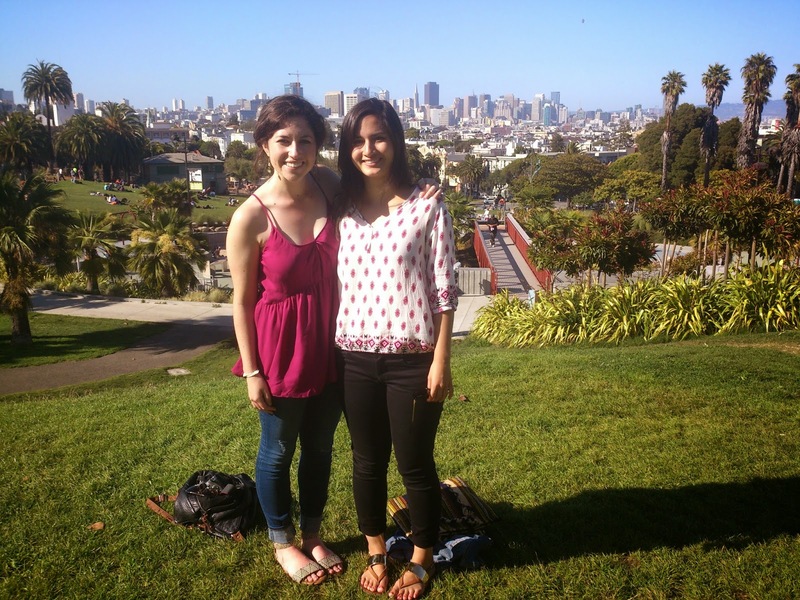 We wondered along Valencia, having realized I had been here before with my best friend, Alexandra, and my mom. We got an iced chai at a coffee shop that had really great ratings on Yelp...I would have gotten coffee, but you see, I am not a huge coffee drinker. I do like my guilty pleasure of coffee frappuccinos at Starbucks every once in a while, but even then I would not really consider that coffee. 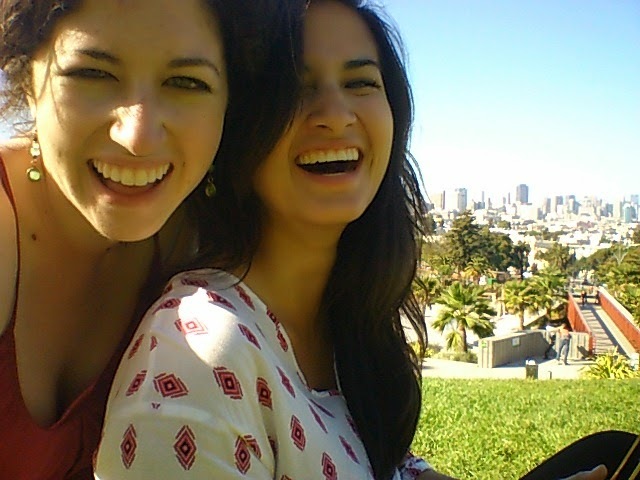 Anyways, we walked a couple blocks and made our way to the top of Dolores Park. Danielle could not have come on a more perfect day, the sun was out, which meant there were crowds of people at the park enjoying the beautiful view. I have been to this same spot a couple of times, but it never ceases to amaze me. Customary to many locations, we had a mini photo shoot. I would say we were here for quite some time before we decided we should head over to the murals because we were getting hungry. I had visited these murals twice in my three years of living in San Francisco, and my reaction is always the same. I love looking at the simplistic or complex paintings that occupy this alley. I even had a moment when I saw my girl, Frida Kahlo, portrayed in one mural. What the murals mean to me is pride. Pride in your roots and where your family comes from. Along with, struggle. The struggle of moving to a foreign place, trying to provide for your family to live out the "American Dream." I take these messages to heart because I am a product of parents who came to America in hopes for a better life for themselves and their children. This is one reason why I love the Mission district. The hispanic culture, after so many years, is still strong regardless of the remodeling and big tech companies trying to move in. I think of my dad too. His work predominately takes place in the Mission, so I think of him every time I am there and the life that goes on around him. After being bombarded by elotes (Mexican corn on the cob) and hot dogs on every street corner, we rushed to get dinner as our feet were getting sore from the walking and our tummies were growling. It was well worth the wait, topping the night with some ice cream. On this day, we were on a mission to explore and enjoy the day. I think we were pretty successful.